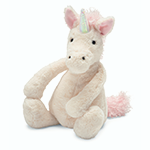 Jellycat Bashful Unicorn is full of magic and moonlight. Sugar-sweet in pink and white, Bashful Unicorn is such a delight, with squish-squashy hooves and a horn that is shimmery-soft. Sprinkle bedtime with stardust and let your childs imagination gallop! Pair it with Jellycats "Magical Unicorn Dreams" book (Sold Separately) to make a great Birthday, Baby Shower, or Just Because gift.